Food purists often fuss about the inadequacies of USDA's organic food standards, how pitifully watered down they are from the lofty principles that built the organic movement. They have a point. After all, the USDA's National Organic Program was created to deal with big agribusinesses determined to exploit the lucrative organic market. But for all the complaints about federal organic standards, the non-certified alternatives -- with some foods especially -- can be downright scary. It's ironic that many of the scariest, non-certified organic foods are labeled "natural" -- a term that could not mean less, or mislead more. Like "home-style" or "old-fashioned," the label "natural" can mean whatever the labeler wants it to mean. You could put "natural" on a lab-grade jar of MSG crystals or on a packet of 10-year-old Twinkies without violating any law. And all too often it's the companies playing the "natural" card that are doing the most unnatural things to your food. Consider the widespread use of hexane, a neurotoxin, in processed foods that aren't certified organic (those lame organic standards do at least prohibit hexane use). Hexane is a highly flammable EPA-listed air pollutant that is used in the manufacture of cleaning agents, glues, roof sealer, automobile tires, energy bars and veggie burgers, as well as soy, corn and canola oils. If these food products are not certified organic, some of the ingredients have probably been processed with hexane, no matter how many times the word "natural" is stamped on the package. Since hexane is used in the manufacturing process, it's not listed as an ingredient in the foods it helps produce, though residues find their way into the finished product. The European Union has strict standards for acceptable hexane residue levels in soy and oilseed products, but in the U.S., there are no such limits. The organic watchdog group Cornucopia Institute arranged for a lab to test samples of U.S. soy products for hexane content. Hexane was found in levels as high as 21 parts per million -- more than twice the 10 ppm allowed by the EU in comparable products. Technology and Solvents for Extracting Oilseeds and Nonpetroleum Oils is a manual for managers and engineers published in 1997. According to this book, the principle reason that hexane has been the solvent of choice for oilseed extraction since the 1930s is "its availability at a reasonable cost." The reason hexane is so reasonably priced is that it's a byproduct of gasoline production that would otherwise be expensive to dispose of properly. Petroleum companies gain handsomely from the fact that industrial oilseed extraction -- under status quo production methods since the 1930s -- provides a profitable market for its toxic waste. Oilseed extraction is currently responsible for more than two thirds of hexane use nationwide. Not surprisingly, much of the research cited in the book is funded by the likes of Exxon and Phillips Petroleum. A chapter devoted to "Toxicity Data for Commercial Hexane" appears to give serious consideration to concerns about hexane's impact on human health, while presenting no evidence that such concerns have been seriously investigated. The chapter explains that "commercial hexane," the type used to extract oilseeds, is a mix of petrochemicals. One of these, n-hexane, which composes more than 50 percent of commercial hexane, has been shown to be a neurotoxin. The chapter acknowledges that humans are about four times as sensitive as rats to n-hexane, especially over prolonged exposures. Nonetheless, in the very next paragraph it's revealed that only one acute neurotoxicity study was considered. The study evaluated the ability of rats to retain a learned behavior immediately following inhalation of commercial hexane, and one and two days later. That's like conducting a carcinogen trial that only monitors the subjects for signs of cancer in the two days following exposure. The chapter concludes that "commercial hexane is a relatively safe chemical," despite the fact that it consists mostly of a known neurotoxin. Hexane-extracted soy protein, a favorite of vegetarians and body builders, turns up in some unexpected places, according to the November Cornucopia Institute report on ways that soy proteins and chemical solvents intermingle in nutrition bars and meat alternatives. Popular protein bars like Clif, Mojo, Balance and Luna all contain hexane-processed soy, according to the report, as do Boca veggie burgers, Gardenburger products, Trader Joe's veggie burgers, and many more. Because the supply chain of many soy-containing products is long and complex, companies have some wiggle room in how they respond to inquiries from concerned consumers. According to Cornucopia, companies that make soy-based food products have responded to inquiries about hexane with answers like, "Our soy ingredients are not hexane-derived" and "[Our company] does not use hexane to process soybeans." Both answers are worded to give the impression that the product did not come into contact with hexane. But in the first sentence, "hexane-derived" actually means "created from" hexane, rather than "treated with." And the latter claim leaves open the possibility that the company's supplier did the hexane-laced dirty work. 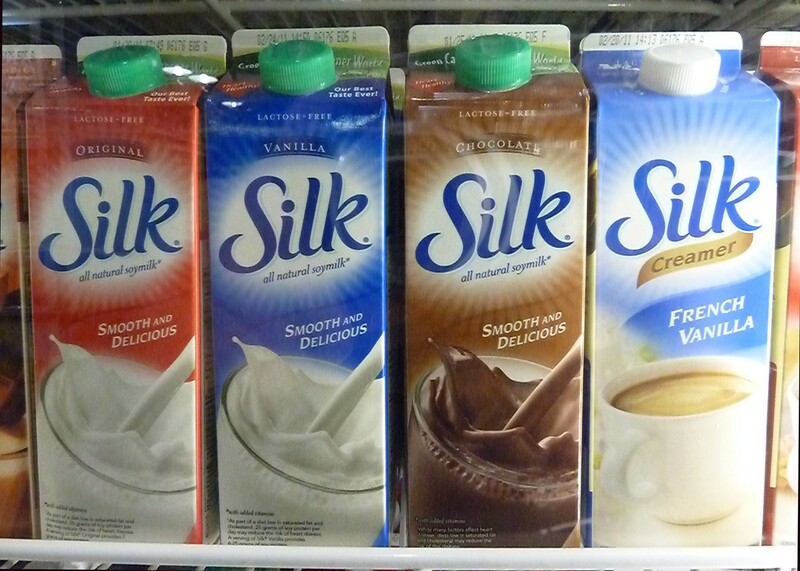 I got a similar answer when I contacted Dean Foods, which owns White Wave, the company that makes Silk Soymilk: "Silk does not use hexane in the manufacturing of any of our products." According to the Cornucopia Institute, Silk's non-organic "Light" and "Heart Health" soymilk products are made with soy flour instead of whole soybeans, and the "only known" sources for non-organic soy flour involve hexane. Of course, it's possible that White Wave has found a way to source its soy flour from hexane-free sources, which buys a measure of hope for Silk lovers who are concerned about hexane. Soy products have been under fire from many directions for more than just the hexane issue. The heavily subsidized crop isn't easily digested without some form of processing, and there are concerns that estrogen-like molecules in soy can mess with the human hormonal system. That's why many consumers have switched from soy milk to other non-dairy milk substitutes, like almond milk. Nonetheless, another soy product, soy lecithin, manages to make its way into most of these alternatives. And guess what? Unless the product is organic, that soy lecithin was probably processed with hexane.